DISTURBED have announced a 2016 tour in support of their upcoming sixth studio release, Immortalized. The tour, which kicks off March 11th in Vancouver, will offer a rare chance to see DISTURBED's arena-ready show in an up close and personal setting, such as The Fillmore in San Francisco, Irving Plaza in New York City, Roseland Theater in Portland, and more. Fans who pre-order the new album on Disturbed1.com will have exclusive access to the ticket presale on August 18th at 10 AM, local time. Tickets are available to the general public starting on August 21st. "Our return from hiatus was for one reason: we are dying for our fix of the live experience," said David Draiman. "We need to satisfy our addiction to the feeling you get when you play to the most dedicated and vibrant fan base in existence, the DISTURBED ones. We know the arena shows will come, but we wanted to start out feeling like it did in the old days. Intimate, hot, and intense. We can't wait. Prepare yourselves. The Leviathan has risen." DISTURBED will perform their first show in four years at the House Of Blues in their hometown of Chicago on August 21st. The underplay marks the end of their hiatus and the release of Immortalized. 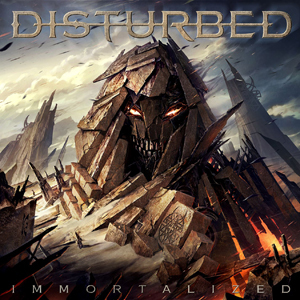 Fans who pre-ordered Immortalized from the DISTURBED Music Store gained exclusive access to the fan pre-sale. The Grammy Award-nominated foursome announced the end of their four year hiatus with the launch of new single "The Vengeful One”. The accompanying animated video was directed by award-winning filmmaker Phil Mucci. "The idea was to leave when we were at our peak, which we were, and to come back when we felt reinvigorated," asserts Draiman. "We had basically been going nonstop since 1998," adds Wengren. "We got to do our own things. It didn't take too long until the itch started coming back." And Donegan agrees: "We wanted to return when we collectively had that fire underneath us. We missed it so much that we could tap into this energy and deliver the right album. We did it on our own terms." In January 2014, Draiman, Donegan, and Wengren met for dinner in their hometown of Chicago. Shortly thereafter, without notifying friends, families, or their label, the three began to fly back and forth to each other's respective home studios for writing sessions, marking the beginnings of Immortalized and the first time they collectively wrote together since 2001. "For this album, everything was written in the same room," Draiman remarks. "It was wonderful experiencing how it used to be back in the day for us. That became apparent in the material, whether it was the passion of the performance, the power being harnessed, or the feelings evoked. We could feel the difference." Pre-order the album, including deluxe limited edition bundles, HERE.